syntagmatic lexical functions, that connect the lexical unit to its collocates within collocations of which it is the base – Magn (intensifiers), Operi/Funci/Laborij (support verbs), Reali/Facti/Labrealij (realization verbs), etc. From a formal point of view, a Lexical System is a graph of lexical units of the small world family (Watts & Strogatz 1998), whose structure is analogous to that of a “social network of lexical units.” It is therefore radically distinct from taxonomic models, where the lexicon is primarily organized as a hierarchy of lexical unit classes. 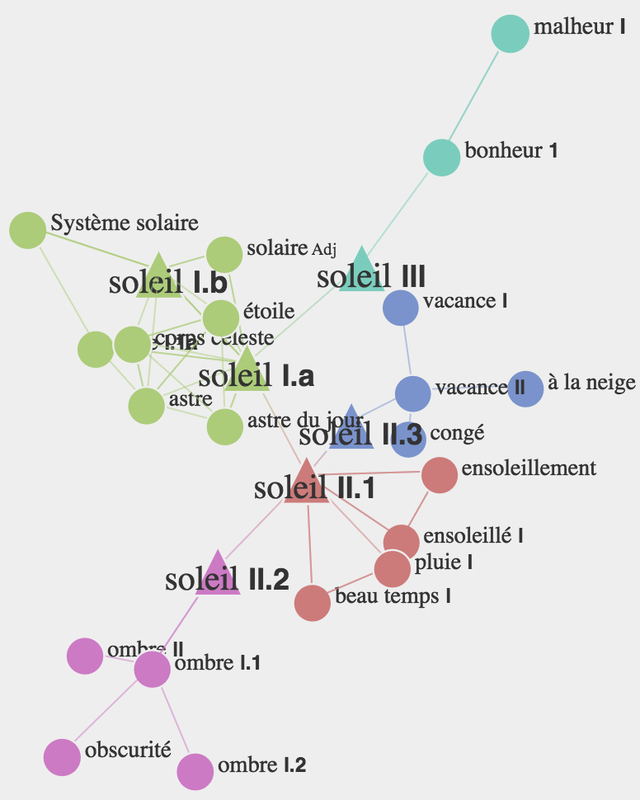 Polguère (2009) introduces an initial theorization of the notion of Lexical System; Polguère (2014) presents the lexicography of Lexical Systems that is based on insights gained when working, mainly, on the French Lexical Network (fr-LN). Polguère A. (2014) From Writing Dictionaries to Weaving Lexical Networks. International Journal of Lexicography 27(4), pp. 396–418. Polguère A. (2009) Lexical systems: graph models of natural language lexicons, Language Resources and Evaluation 43(1), pp. 41–55. Watts D. J., Strogatz S. H. (1998) Collective dynamics of ‘small-world’ networks. Nature 393, pp. 440–442.